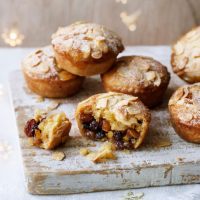 The cream cheese pastry in this recipe takes the mince pies to another level. It’s crumbly, extra-rich and, when paired with top-quality mincemeat and a buttery frangipane topping, makes a sophisticated treat. a food processor. Add the butter and pulse in short bursts until the mixture resembles fine sand. Add the soft cheese, ground almonds, egg yolk and 1 tbsp cold water and blitz again until the dough starts to come together. Use your hands to bring the dough together into a neat ball, ensuring you don’t overwork the pastry. Flatten into a disc, cover with cling film and chill for at least 1 hour. 2. Lightly flour a work surface. Halve the dough and roll out one piece to a circle about 0.2cm thick. Using an 8cm fluted cutter, stamp out as many circles as you can and use to line a shallow 12-hole bun tin (or you can use a muffin tin, as we did for the front cover), gently pressing the dough into the holes. Repeat with the second half of the dough – you should aim for around 24 pastry cases in total. Chill the pastry cases for 20-30 minutes. 4. Put 1 tsp mincemeat into the bottom of each pastry case and top each with 2 tsp frangipane, spreading it to cover the mincemeat. Scatter with flaked almonds and bake for about 20 minutes, until puffed up and golden brown. You may need to swap the trays over halfway through cooking to make sure that the pies cook evenly. 5. Remove from the oven and leave to cool in the tins for 4-5 minutes, then carefully transfer to a wire rack until the pies are at room temperature. Dust with icing sugar before serving.